A man wearing a Santa costume carries a Christmas tree, handed out free by the Jerusalem municipality, as he walks past a vendor in Jerusalem’s Old City, Israel, December 22, 2010. 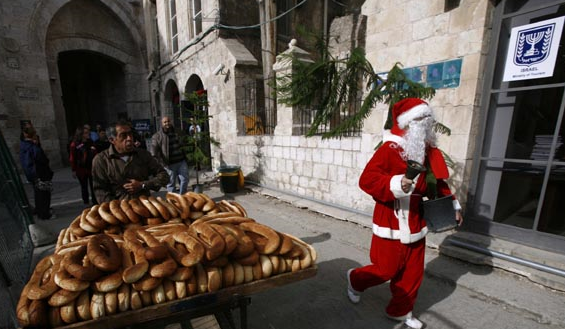 During the Christian holydays the PA suddenly remembers the Christian Arabs and treat them as friends and brothers. In fact, non-Muslims are treated in the Palestinian Territories and in Gaza as nonbelievers and have a harsh life as a minority. The current pope, Francis, accused Muslims of this inacceptable policy. Nice pic! Christmas wishes to all those celebrating from me, as well. With this link, http://www.ynetnews.com/articles/0,7340,L-4607812,00.html , I am emphasizing my comment of today 7:21.